This cabbage casserole is like cabbage rolls undone! 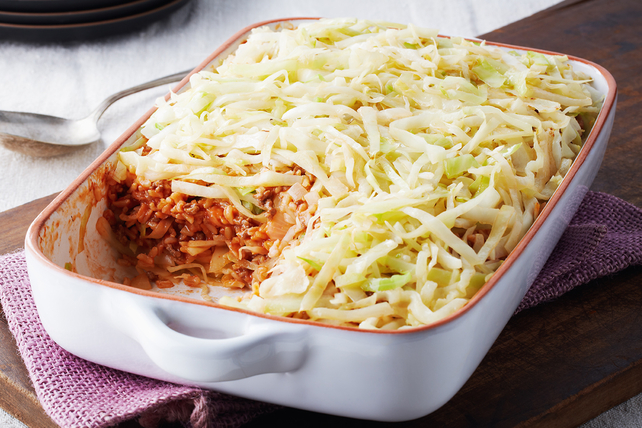 Saucy beef, tender rice, shredded cabbage and onions - no rolling required is required for this oven-baked casserole. Cook and stir cabbage and onions in dressing in large skillet on medium-high heat 5 to 10 min. or until tender. Remove from skillet. Brown meat in same skillet. Stir in rice, soup and water until blended. Layer 1/3 of the cabbage mixture and half the meat mixture in 13x9-inch baking dish. Repeat layers; top with remaining cabbage mixture. Cover. Quarter the head of cabbage, then cut away the core. Cut crosswise into thin shreds. Help your friends and family eat right with this easy-to-make casserole. As a bonus, it provides a good source of iron.